Before you get started, take a look at our digital patient guide! Your admission to Columbus Regional Healthcare System is requested by your physician who is a member of the medical staff of Columbus Regional Healthcare System. Upon admission, you will be asked many questions by admitting personnel. Unless you are an emergency patient, you should arrive at our Admitting Office at the time specified by your physicians’ office or pre-registration personnel. Monday – Thursday 6:00am – 5:00pm and Friday 6:00am – 3:00pm. Please report to Patient Access in the Emergency Department after Admitting Office hours. For billing inquiries please see the Financial Representatives located at the entrance of the yellow canopy. Financial Representatives will be available Monday through Thursday 6:00am – 5:00pm and Friday 6:00am – 3:00pm. Call Customer Service (located in the Billing Department) at (910) 642-1744 to inquire about a bill and/or make a payment by phone. Hours of operation for the Billing Department are Monday through Friday 7:00am – 3:30pm. Columbus Regional Healthcare System does not assume responsibility for the loss of any valuables during your stay. The hospital cafeteria, located on the first floor, is open to visitors as well as staff. Breakfast is served from 6:00 am – 10:00 am; lunch from 11:00 am – 2:30 pm; dinner from 4:30pm – 6:30 pm. Vending machines are located on the first floor at the Visitor Entrance, Outpatient Entrance and the Emergency Department. For your convenience, the cafeteria dining area is open 24 hours a day. The hospital gift shop, “The Sunshine Shop,” is located on the first floor in the lobby area. Open seven days a week and operated by our volunteer staff, The Sunshine Shop offers beautiful gifts, cards and flowers. CRHS offers spiritual care in the form of chaplain services. Services include: daily rounds, on-call emergency response, end-of-life concerns, prayers or rituals, crisis counseling and family support. Learn more about Chaplain Jeremy Simmons and spiritual care services at crhealthcare.org/patients-visitors/spiritual-care/. You can call 910-642-1702 for the Chaplain’s Office, or for more information on the Clinical Pastoral Education program. Visitors can be good medicine for patients. Family members and friends are welcome to visit. However, patient care is our primary concern. In order to enhance the quality of care, the following visiting hours and regulations have been established. Only one visitor is allowed with a patient at any time. The exception is children, who may have both parents with them in the Emergency Department. Parking for patients and visitors is available 24 hours a day, seven days a week. Patients and visitors are cautioned not to park in reserved areas or certain designated areas. While security is typically not a problem, we ask that you be sure to lock your car and store valuables in your trunk. If something happens that requires assistance with your vehicle, please call the Operator or the Security Department at Ext. 2333. All outpatient Ancillary Departments have waiting areas as well. Many hospitals across the country are working to make health care safety a priority. We encourage our patients to be active participants in their healthcare through the use of the “Speak Up” program. Speak up if you have questions or concerns and if you don’t understand, ask again. Anytime you or a family member is a patient at Columbus Regional Healthcare System, please bring your current medications or a list of them (and dosage) as well as any drug and/or food allergies you may have. All medications you take while in the hospital are prescribed by your doctor, dispensed by the hospital pharmacy and administered by a nurse. Patients are not permitted to administer their own drugs or keep personal medications at their bedsides. Infections can occur after many types of medical procedures and at Columbus Regional Healthcare System policies and procedures are in place to avoid such infections. However, there are several things you can do to help prevent infections from developing in the hospital such as: hand washing, hand sanitizing, keeping dressings clean and dry and asking friends and family not to visit if they themselves feel ill, among others. Talk to your nurse promptly if you have an infection control question. For a description of how medical information about you may be used or disclosed (as well as how you can gain access to this information) please read Columbus Regional Healthcare System’s Notice of Privacy Practices. If you have concerns about patient care or safety at Columbus Regional Healthcare System or any of its affiliates, you are encouraged to share your concerns with your nurse, the supervisor on duty or administration. 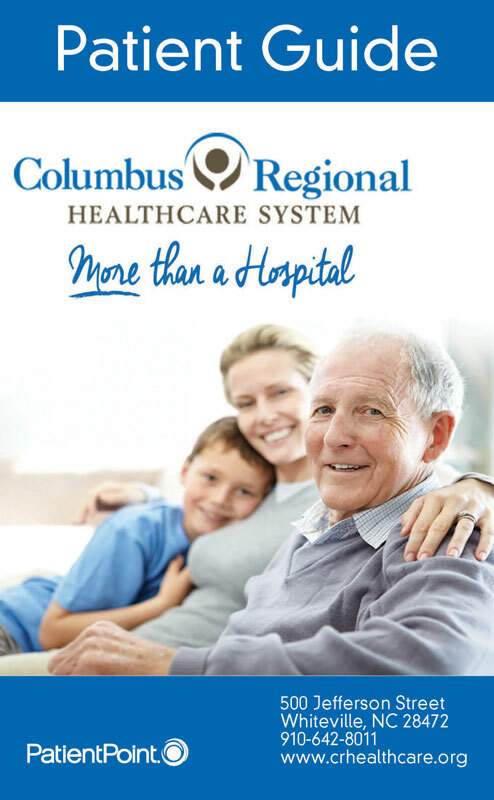 Thank you for choosing Columbus Regional Healthcare System as your healthcare provider!